Have you ever thought about running away to join the circus? Why not turn your dream into a reality! It’s all about keeping life interesting, after all…isn’t it? There’s no end to the many faces you can paint with this professional quality kit. Guaranteed, you’ll never put on the same face twice…unless you want to. 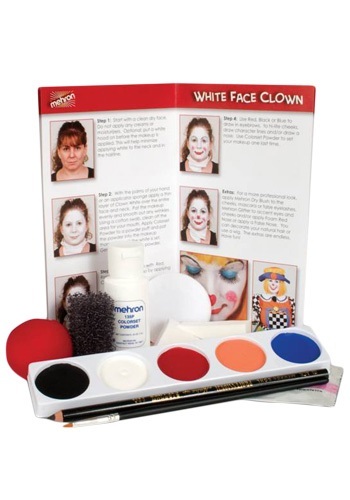 The matte white base in this kit is the foundation to every clown face, whether it is happy, sad, or indifferent. Have you ever heard of an indifferent clown? Neither have we, but it can probably be created with this Clown Costume Makeup Kit. In addition to the booklet included with your kit, you can find unlimited clown tutorials on the Internet these days. And now, you’ll have everything you’ll need to create the ultimate clown expression, including classic, funny, creepy, or downright scary. Whatever you decide…you can put on your clown face like a pro, and get ready to enjoy the spotlight!